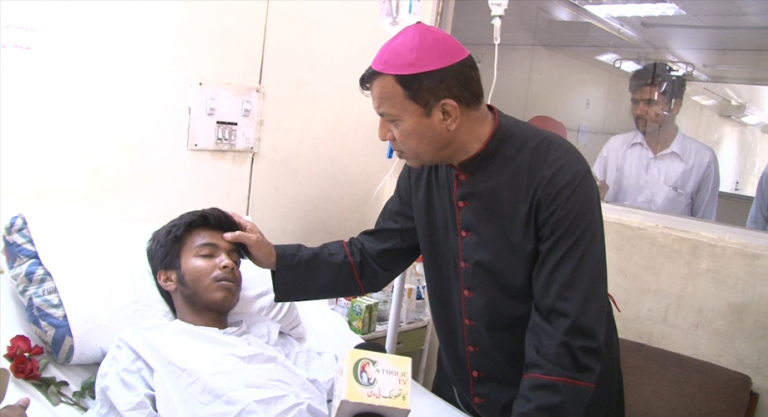 Catholic parents whose son was killed by a suicide bomber in the 2016 Easter Sunday attack at Gulshan-i-Iqbal Park, Pakistan have told Lahore’s Archbishop that they have forgiven the man that killed their child. Speaking to Catholic charity Aid to the Church in Need, Archbishop Sebastian Shaw said: “[A]fter celebrating Holy Mass I went up to a married couple to give them my blessing. Pakistani Taliban group Jaamat-ul-Ahrar, which has reportedly declared ties with Daesh (ISIS), took responsibility for the attack that killed 78 people and injured more than 300. Christians in Pakistan have suffered a number of suicide bomb attacks on churches and public places, including the targeting of Churches in Youhanabad, Lahore in March 2015, where at least 15 people were killed and dozens were injured. When Archbishop Shaw attended ACN’s annual Westminster Event last October, he spoke of the Easter Sunday attack and the prejudice against Christians in Pakistan which includes the presence of ‘hate’ material in their state school curriculum. Pakistan’s 190 million population is overwhelmingly Islamic, with Christians making up just two percent. The archbishop’s diocese is the largest in Pakistan, with more than 450,000 Catholic faithful in the capital of Pakistan’s Punjab region. He thanked ACN for translating the Catechism of the Catholic Church into Urdu, enabling Pakistani Catholics to learn more about their religion.